How can “digital changes everything” work for you? If you want exponential growth and leadership, here is a huge opportunity from our networked world that rapidly adopts new technology: today’s tech-driven world causes widespread declines. People’s incomes have stagnated while the wealth of elites has soared. Massive job losses are forecast from AI, robotics, and automation. Giant digital platforms push entire industries into downhill slides, with Amazon’s advances triggering new waves of bankruptcies and fears. Both people and companies need new disruptive options. Your rise could start with a new “big flip” to your leadership, by adding people-first technology to your business. Imagine a planet of universally successful and prosperous people. Billions grow every minute, advance every day, reach their dreams as a normal part of life. Greatness becomes normal for everyone. Lead this with an exponential growth publishing platform that people and companies need if they are going to rise again, to reach the top. Build and lead a prosperous, people-first planet that includes everyone, and helps everyone switch from decline and growing weaknesses so they can join you in the lead. Instead of a few winners-eat-everything dystopia, billions of people and thousands of companies can help lead a successful digital Earth with you as the leader. Today’s duality: are you in control, or are you being controlled? Think about how you are surrounded by networks. The room you’re in has electric plugs with wires behind the walls, bringing you electricity from the grid. Your house’s plumbing connects your kitchen and bathrooms to both water and sewage systems. When you step outside, the road in front of you lets you drive pretty much everywhere. If you drive to the airport, you can jump on the air transport network and go to most places on Earth. An even bigger network is invisible. The Internet reaches you by cable and wirelessly by WiFi and your mobile phone. You can see networks are everywhere, and they all share something important. Every one of them is developed and directed by people. The question is do the networks control you, or do you control the networks? What would happen if you could lead a network that everyone controls, and produces the world everyone wants? There is plenty of evidence that managed networks control everyone’s personal life. In the above networks, changes are made every day. The electric grid is shifting from fossil fuels to renewable energy. The road network is shifting to self-driving trucks and cars. The Internet is evolving from one network into private walled gardens owned by giant companies like Facebook, Google, and Amazon, and separate Internet in countries like China, Iran, and Russia. Corporate-first technology drove this dramatic change in society’s wealth. Tech was used to increase company productivity, which increases growth, revenue, and profit. 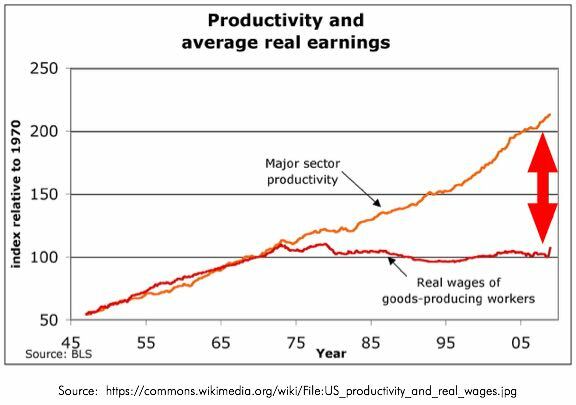 But these were not paid as increasing wages to employees. The rewards were systematically delivered to elites, leaving the middle class and its children behind. What will corporate-first technology produce next? Automation will kill up to 47% of today’s jobs, according to a widely quoted Oxford forecast. 71% of Americans believe the U.S. economy is rigged. 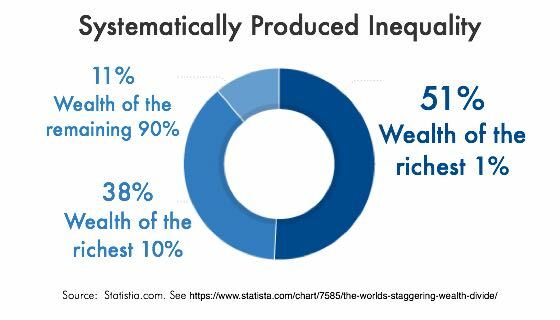 55% believe capitalism causes inequality. Just 19% trust the U.S. government in Washington. Only 31% believe the U.S. is headed in the right direction. Do politicians and business CEOs really think these are problems? Or do they believe they are successfully building a great world that benefits them? If today’s corporate-first system is remarkably effective at building this dystopia, it can’t and won’t solve people’s problems. The world’s enormous wealth will be delivered to a few. Everyone else will keep struggling. This is a huge business opportunity in a networked world with rapid adoptions of new technology. What if a digital Earth and its digital economy were re-envisioned and re-invented to make them people-first? What happens when technology is designed from the ground-up to serve people? It’s done. New people-first tech is designed to make everyone super-smart, super powerful, protected, and in-control. Now the question is how people-first companies and people can take the lead of a universally successful digital Earth together. Here’s how: use exponential growth publishing and start your disruption in a small, smart team. Grow it until you lead the publishing industry. Then scale it to lead a successful digital Earth that includes everyone. Sell it to other threatened companies so they can lead too. Together, give everyone the world’s best knowledge, tools, and abilities at their fingertips, so everyone can rise all the time. They will gain digital boundaries and blended screens, so their screens display their personal choices. For example, you could see healthy food, renewable energy, and only people-first companies. The only visible companies will be the ones people trust and want, and they will be “always on” to provide new connected consumption. Everyone will see the kind of planet they each want, with choices they believe in. For a company to appear, it needs to be people-first, and deliver what that person wants. As connected consumption delivers higher levels of success and satisfaction, these companies will grow to lead the economy. They will raise humanity to achieve above each person’s full potentials. Those people will live on the planet they believe is right for them and their family. This could be a new kind of world you start, a world you lead. The next step is up: yours, the world, or both together? Major change is upon us. A global digital transformation is arriving faster every year. Will this strengthen the same old system, a corporate-first planet of dystopian inequality, with struggling people ruled by super-wealthy elites? Or will we live on a people-first world designed to deliver prosperity and success to everyone? Most corporations won’t help because they don’t understand this future. Their goal is to capture the world’s wealth, not solve its problems. Government won’t help because corporate money dictates politicians’ elections. Government employees are on a career path that revolves between government jobs, corporate jobs, lobbying firms, and think tanks. Think tanks and international NGOs won’t help because government and corporate jobs beckon, so new thinking outside “the system” is a career-killer. If the world won’t help and can’t act, then who will step up to fix the future? How about publishers that are in systematic decline from the dominance of Google and Facebook? Does that include you? Is your survival threatened enough that you would like to start a people-first planet that you can run and lead? If yes, think Big Flip. Think about using networks to drive rapid technology adoptions, and delivering a positive, people-first digital Earth.